Time for the Trendwatch 2017 report! 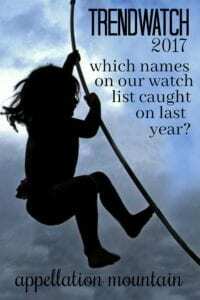 Every year, I choose a list of names to watch. I think they’re likely to rise – or I know they’ve been steadily rising. But I’m guessing that they’ll make the Top 1000 in the coming year. It’s a nice, bright line. Either the names break in – or not. And what can I say? I like a score card, even though I know my hit rate will always be on the low side. Why does it matter if a name makes that magic cut-off? 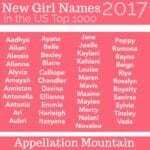 The Top 1000 list is widely discussed and dissected by everyone from baby name enthusiasts to casual pop culture fans. It comes up ALL the time, whenever there’s a wildly unconventional celebrity baby name, a headline-worthy event that inspires parents to name their children accordingly, or just a slow news cycle. 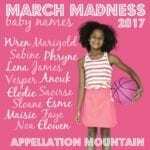 And it’s the list that a great many expectant parents refer to when choosing names. So a name on the list is more likely to catch on than one that’s just outside. Last year, I noticed that I gave up on many names too quickly. A Trendwatch 2015 name might just be catching on in 2018. So I’ve given myself permission to carry names from year to year, instead of starting fresh every time. A note on dates: strictly speaking, we’re always one year behind. The data from January – December 2016 was released in May of 2017. So the 2017 Trendwatch reflects numbers that are already a year old. The date reflects the year the list is published – even though the list itself tracks to the previous twelve months. Now, on to the names! I came in at a mere 4.5/15, much lower than my 6.5/15 performance last year! 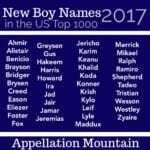 Three of the fifteen Trendwatch 2017 boy names made it! Fox debuted in the US Top 1000, at #746, bolstered by our love of the letter X, nature names for boys, and the enduring character from The X-Files. Shepherd returned to the US Top 1000, at #863 – though the name’s prior tenure in the Top 1000 rankings was brief. One complicating factor? Alternative spelling Shepard is nearly as popular. Harris returned to the US Top 1000 at #967, a former favorite long-absent. Harris fits right in with names like Brooks and Miles, plus Harrison continues to climb. Decker, Kaiser, and Lian all gained in use in 2017, but fell short of reaching the Top 1000. I also award myself a half-point for any name that continues to rise, so that’s an additional 1.5 points, for a score of 4.5/15. Alaric, Ansel, and Benedict were basically flat. I’m still betting on Benedict to tip into the rankings soonish. We love Ben names, leading man Benedict Cumberbatch makes this one broadly familiar – I mean, he’s a member of The Avengers and he’s Sherlock Holmes! Plus, Catholics have embraced this as a saint’s name and the name of a recent pope. But Ansel and Alaric may have missed their moment. Archie, Dashiell, Gatlin, Koa, McCoy, and Taj all fell by at least a few births. I think Dashiell should still make the Top 1000 soonish – after all, Dash is a rising Top 1000 name and another installment of The Incredibles, featuring middle kid Dashiell “Dash” Parr, hits the big screen in 2018. Koa seems like an irresistible Kai-Noah combination, so I’m thinking it still has a shot. Archie, Gatlin, McCoy, and Taj might just be misses. I came in at 7/15, better than my 5/15 performance last year! Four Trendwatch 2017 names cracked the rankings last year. After 25 years’ absence, Louise returned at #897. No surprise after Louisa’s comeback just a few years ago. Mavis, gone since the 1960s, returned to the charts, too, thanks to a stylish sound and a teenaged vampire. It now stands at #789. As for debuts, both Poppy and Sylvie made the list for the first time. Flower power name Poppy came in at #747, while Sylvie – a perennial Appellation Mountain favorite – came in at #957. Della, Florence, Luella, Marlowe, Seraphina and Winnie all fell short of making the May 2017 list, but they all rose in use, for a half-point each. Marlowe suffers from a similar problem to Shepherd/Shepard – multiple spellings can make it tough for a name to reach the Top 1000 threshold. And I wonder if Winnie’s popularity is masked by the many possible formal names, from Winifred to Winter, that some parents may choose? August fell by about 22 births for girls. That’s about 9%, a pretty decent drop in use. I’m ready to call this one a miss. The others fell by much smaller numbers. There were four fewer girls named Beatrix; eight less Clovers; a drop of seven Harriets; and five fewer Scouts. I think all four of these might still have plenty of potential. 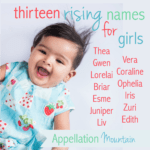 Though I do wonder if the To Kill a Mockingbird influence in baby names is fading? Or if the continued popularity of Harper and Atticus mean that Scout still has a chance? I do think it’s a great name, capable and literary and cool, too. Stay tuned for the Trendwatch 2018 predictions, where I attempt to guess the names likely to debut in the US Top 1000 when the new list debuts in May 2018.